Think we have it bad? 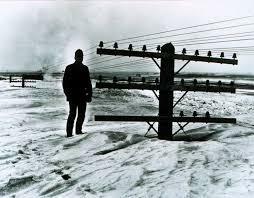 This photo from a 1966 March blizzard in North Dakota was jokingly captioned: I believe there is a train under here somewhere! March came in like a lion and seems poised to go out the same way. Is this a month for the history books? It has been an unusually cold and snowy winter for the northeast. The first flakes flew clear back in November, but that feels like years ago. As of March 24th, total snowfall in Boston was 58.6 inches - well above the average 44 inches. And, according to the National Climatic Data Center, average annual snowfall in Hyannis is just fifteen inches. Need we say more? February 27 - March 7, 1717: The Great Snow of 1717 was actually a series of four storms that dumped a combined total at least five feet of snow on New England, with much higher drifts. It is often compared to the Great Blizzard of 1888. In the decade that followed, partly in response to the 1888 storm and the massive gridlock it wrought, New York and Boston broke ground on the country’s first underground subway systems. March 1-2, 1914: This storm boasted the all-time lowest barometric pressure readings for New York City (28.38”, 962 mb), New Haven (28.25”, 957 mb), and Bridgehampton on Long Island 28.10” (952 mb). New York City got 14 inches of snow with wind gusts to 84 mph. This storm was very similar to the Blizzard of 1888 in that the axis of heavy snow and blizzard conditions ran due north from New York City. Little snow fell in eastern New England. March 18-20, 1956: While not a true blizzard, this storm dumped up to two feet of snow on the northeast. March 18-21, 1958: Worcester, MA got an impressive 19 inches of snow, but that was dwarfed by the 50 inches of snowfall in Morgantown, PA.
March 2-5, 1960: The worst Nantucket blizzard on record left behind 31.3 inches of snow. The storm was centered off Cape Cod. All of eastern Massachusetts felt hurricane force winds and got 20-30 inches of snow. March 12-15, 1993: The Storm of the Century packed hurricane-force winds felt up and down the eastern seaboard. The highest winds were recorded atop Mount Washington (144 mph! ), but the southeast took the brunt of the storm with 56 inches of snow on Mount LeConte, TN. The storm also spawned more than a dozen tornadoes in Florida. Every major airport on the east coast was closed at one time or another by the storm - a first. This storm was also notable for being the first time states could declare a state of emergency before snow even started, thanks for a successful five-day forecast. March 31 - April 1, 1997: The April Fool's Day Blizzard dumped up to three feet of wet snow on the northeast and left hundreds of thousands of people without power. The storm immobilized Boston for days with over 25 inches of snow - the third or fourth heaviest snowfall on record for the city, depending on the source - and high winds with gusts of 50-70 mph. The tip of one of the masts of the USS Constitution broke off in the storm. So it could be worse. Weather Underground's Chris Burt stopped before providing a list of historic April snow storms. Let's hope we don't need it.